Season 14 here we come! The CW announced the renewals of 10 shows today, including Supernatural. More on this from TvLine and Deadline. Other shows renewed include Riverdale, Crazy Ex-Girlfriend, Jane the Virgin, Dynasty and all the shows in the DC Universe. Congratulations to all, but especially to Supernatural. Cast, BTS Personnel and Other reactions! @Jarpad @JensenAckles @mishacollins Congrats to all of you! On March 29, a portion of all sales of “Scoobynatural” and other Supernatural merchandise — sold online and in-store that day — will be donated to two charities of the actors’ choosing: Random Acts and Attitudes in Reverse. Kim Rhodes won a Canadagraph Award for her role as Jody Mills on Supernatural. Kim joins Richard Speight, Jr. as a Canadagraph Award Winner. Congraturaltions Kim! Here is the Supernatural panel from PaleyFest March 20, 2018! 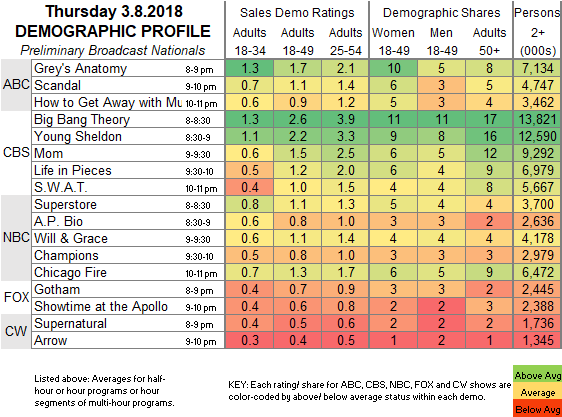 We dropped in the 18-49 demo from last week, but rose in total viewers. Here is Jensen's segment on Jimmy Kimmel Live. For you spoilerphobes, it includes a clip from episode 16. We have more on Supernatural's appearance at PaleyFest this year! The most important fact is that the panel will be live streamed! We can all see what they have to say. If you can’t join us at the Dolby Theatre, you can watch select events LIVE on Paley Center’s Facebook page. Like our page to tell us you’ll be watching! #PaleyFest is only streaming select panels this year (#TheHandmaidsTale #TBBT #YoungSheldon #TheGoodDoctor #Mom #Supernatural #QueenSugar #Riverdale #StrangerThings) -- and on Facebook. You've been warned.